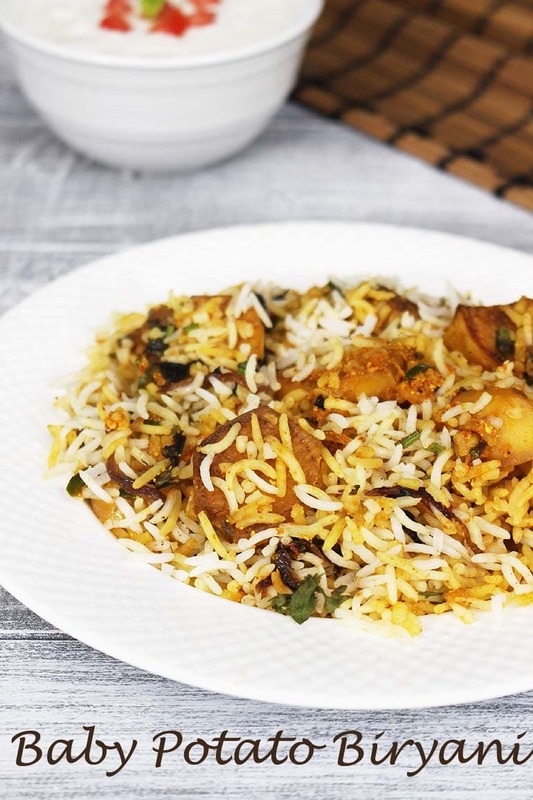 Baby Potato Biryani Recipe – a dum cooked biryani with tender, soft baby potatoes and fragrant fluffy rice. 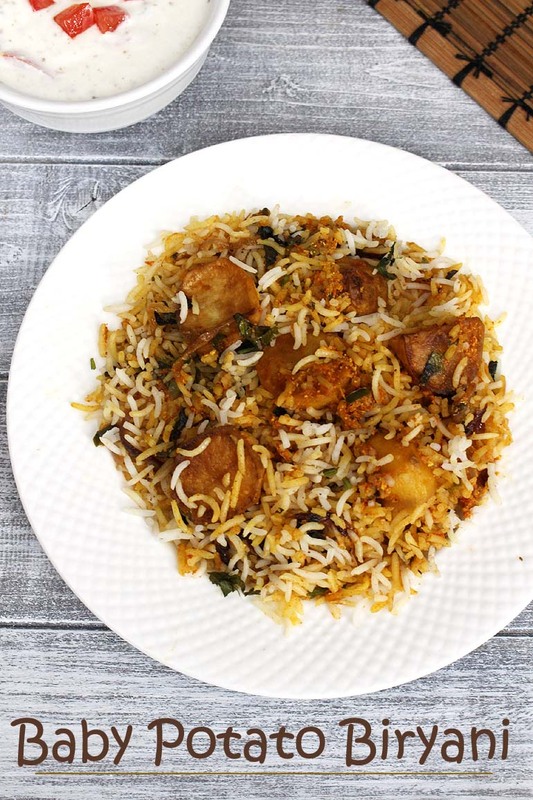 You are going to love this aloo biryani because it is super tasty and full of flavors. Of course not to forget just like any other biryani dish, this is also a fragrant dish. The kitchen will have its mouthwatering aroma while it is cooking. I have already shared the hyderabadi style veg biryani and paneer biryani on the blog and you will see more varieties in future. This is little easier version compared to the traditional dum cooked biryanis. Here we are partially cooking the rice separately. Then making baby potato gravy in large pan. On top layering with rice, fried onions, coriander and mint leaves. The whole thing is cooked on slow flame for some time. So all the flavors will have time to mingle and rice will absorb the delicate flavors of added spices and herbs. Here I have not added any nuts. If you want you can fry some almonds, cashews and raisins before frying the onions. And layer them later along with fried onions. As the name says ‘baby potato biryani’, I have used baby potatoes. Since my baby potatoes are slightly bigger in size, I have halved then and quartered some of them. Instead of baby potatoes you can use regular potato cut into big chunks. 1) Wash the rice under running cold water till water runs clear. Or rinse with water 2-3 times till water is not cloudy anymore. Soak rice in enough water for 15-20 minutes. 2) Meantime prep rest of ingredients to make dum aloo biryani. Now take 4 cups of water in pan and turn the heat on medium high. Add salt and whole spices (green cardamoms, black cardamoms, cloves, cinnamon stick, bay leaf and star anise). 3) Let it come to a rolling boil. 4) Discard the soaking water from the rice and add rice to the boiling water. 5) Cook the rice for 5 minutes and then turn off the stove. Rice should be 80% cooked. 6) Immediately drain all the water with the help of colander. 7) Spread the rice to the plate, so they do not stick to each other and stay separated. Remove the whole spices. 8) Now heat 4 tablespoons of oil in pan on medium heat. Once hot add baby potatoes. 9) Keep turning them around at intervals for even browning. 10) Remove it to a paper towel lined plate when they are golden brown from all the sides. They should be 90% cooked, check by inserting a knife. 11) In the same pan, add 1 tablespoons of oil to make fried onions. Once hot add sliced onions. 12) Fry them till they are golden brown. 13) Once ready, remove it to a plate. 14) Again add another 1 tablespoon of oil. Once hot add whole spices (green cardamoms, cloves, cinnamon stick). Saute for few seconds or till you get the nice aroma of the spices. 15) Then add sliced onions. 16) Saute till they are soft and translucent or light pink in color. 17) Add ginger paste, garlic paste and green chilies. 18) Mix and saute for 30-40 seconds or till the raw smell of ginger garlic goes away. 19) Add pureed tomatoes and mix. 20) Cook till it becomes thick paste and all the water evaporates. 21) Add salt, turmeric powder, red chili powder, coriander powder, biryani masala or garam masala and kasoori methi. 22) Mix and cook for a minute. Then add ¼ cup of water and cook for 1-2 minutes or it becomes thick again. 23) Now lower the heat and add yogurt. 24) Immediately mix with spatula to avoid curdling. Crank the heat back to medium and bring to a simmer and cook for 2-3 minutes. 25) Now spread the fried potatoes in single layer. 26) Next spread half of fried onions, chopped coriander and mint leaves. 27) Then spread the semi-cooked rice. 28) Sprinkle garam masala over the rice. 29) Next spread rest of the fried onions. 30) And then rest of the mint and coriander leaves. 31) Lower the heat to lowest possible. Cover it with aluminium foil and then with lid or thali. Put some weight on top of the lid. Cook in low for 15-20 minutes. 32) Then open the lid and lightly fluff up the biryani and serve. Serving suggestion: Serve baby potato biryani with your choice of raita and roasted papad. I like onion tomato raita, mint raita, cucumber raita, boondi raita, vegetable raita or tomato raita. Baby potato biryani recipe (dum aloo biryani) - a dum cooked biryani with tender, soft baby potatoes and fragrant fluffy rice. Wash and soak the rice in enough water for 15-20 minutes. Then bring 4 cups of water to a rolling boil. Add salt and whole spices, then add soaked rice. Cook for exactly 5 minutes, then turn off the stove and strain the rice. Spread the rice in a plate and discard the whole spices. Heat 4 tablespoons of oil on medium heat and fry baby potatoes till golden brown and 90% cooked. Remove it to a plate. In the same pan heat 1 tablespoon of oil and fry onions till golden brown to make fried onions. Remove it to a plate too. Again add another 1 tablespoon of oil. Once hot add whole spices and saute for few seconds. Then saute sliced onions till soft and light pink in color. Mix in ginger paste, garlic paste and green chilies. Saute for 30-40 seconds or till the raw smell of ginger garlic goes away. Now mix in tomato puree and cook till it becomes thick paste. Add salt and spice powders, mix and cook for a minute. Lower the heat and add ¼ cup of water and whisked yogurt. Immediately mix it. Crank the heat back to medium and bring the mixture to simmer and cook for 2-3 minutes or till becomes thick gravy. Spread the fried baby potatoes, half of the fried onions and half of chopped mint, coriander leaves. Next layer the cooked rice and sprinkle garam masala. Over the rice, spread rest of the fried onions, mint and coriander leaves. Lower the heat to lowest possible, cover the pan with aluminum foil and put the lid on. Put some weight on the lid for dum cooking. Cook for 15-20 minutes. Then lightly fluff the dum aloo biryani and serve. looks nice but surprisingly you haven’t used any biryani masala but only garam masala. 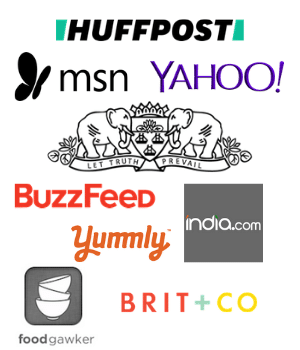 Forgot to write “garam masala or biryani masala”.